If you haven't seen the article and photos about the Peace Walk at Windermere in the New Day Herald, please click here. I wanted to let you know that Future, our retired Windermere horse, is doing very well these days. Those who have known and loved her may remember her loving, affectionate nature, and the countless horseback rides and carriage rides she has given. Her Essential Quality of Peace is "Assertiveness." 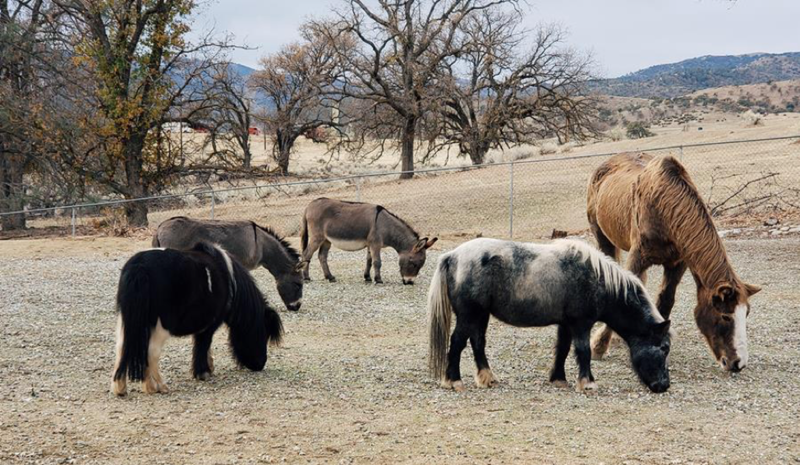 Future is now living with me in the mountains near Bakersfield, California, accompanied by two miniature horses, and two miniature donkeys. Future is 30 years old this year, and she is happy and healthy. She has plenty of room to roam and relax, and seems entertained and amused by her adorable new companions. Click here to see photos of Future and her companions. Enjoy some classic shots of John-Roger with the horses and the folks of Windermere Ranch. with loving, Lynn... for all of us up at the Ranch. Nota: Las cartas y diversas actualizaciones ahora están disponibles en español! Favor de enviarme un email, si deseas recibirlos en español.